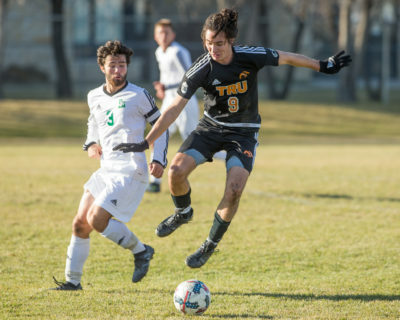 TRU played its first ever Canada West playoff game on Oct. 27 against the University of Saskatchewan Huskies in Saskatoon. It was a dominant win. The ‘Pack led 2-1 at the half, after goals from Mitch Popadynetz (fourth year, midfield, Nelson, B.C.) and Ryan Glanville (fifth year, midfield, Williams Lake, B.C.) 15 and 30 minutes in respectively. If coach Antulov and TRU thought that was a great first half, things only got better in the second as they scored three unanswered goals. Forward James Fraser (Penticton, B.C.) did what forwards do best. He scored two in the second half at the 81- and 90-minute marks. Thomas Lantmeeters also got in on the action with a goal in the 86th minute. “[I’m] very happy with our first Canada West playoff win,” said coach John Antulov when speaking to TRU athletics. Antulov expressed his delight at the performances of subs, Koffi Nyavor (third year, Lethbridge, Alta.) and Anatoli Leville (first year, midfield, Winnipeg, Man.) who came on in the second half. Antulov also had high praise for forward James Fraser. TRU moves into the Canada West final four. Coach Antulov and his team will be hoping that the good times roll on in what has already been a historic season for TRU.